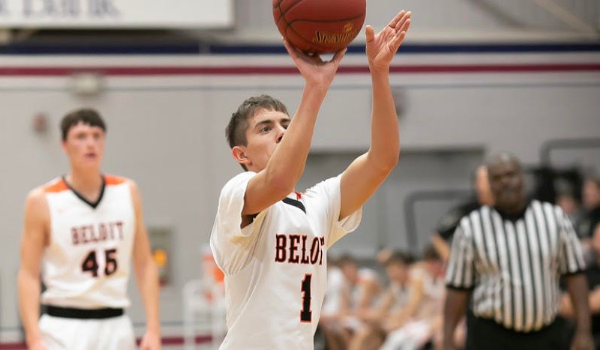 Vincent Palen, junior of Beloit High School, put himself on the map last season after averaging 15.1 points per game. He earned all-league first team and honorable mention all-state honors in 3A from Sports in Kansas. His team, led by head coach Ryan Eilert, finished the season at 12-10. Fast forward to this year he is averaging over 16 points per game, 3.4 assists, 2.1 boards and nearly a steal per contest. The junior is also lighting it up from three-point range with 43%. Palen grew up around the game with his dad being a referee and him traveling with him as a young kid. Palen is an all-around player that can shoot it from the inside but also has the ability to take it inside for a lay-up despite his size at just 5-foot-10. Beloit is also off to a very good start in 2018-2019 with a 14-1 record and look to be one of the highlighted teams in 3A this season. That’s already two more wins then they had a season ago. They feature Hudson Smith, Carson Cox, Collin Chandler and Tate Thompson. Thompson is 6-foot-8 and has a great inside game. They also bring size off the bench in 6-foot-6 Bryce Mason. Hayden Budke, Braxten Eilert and Hudson Gray also provide valuable depth for the Trojans. The Trojans only loss this season came to 4A Chapman who is also off to a very solid start with just two losses. Beloit would currently be the one seed in their sub-state in 3A that is being hosted by Riley County. Also, within that sub-state is Riley County who is off to a 10-4 mark. Five of the eight teams, including Beloit, have a winning record in the sub-state. It won’t be an easy path for the Trojans but they have the pieces and defense to make a run to the state tournament. They allow only 43 points per game, while scoring 60. For now, Palen and company look to continue their hot-streak this season as they take on Southeast of Saline on Tuesday. Beloit is currently ranked #4 in the KBCA Boys Rankings as of Monday. We caught up with the breakout junior below in the latest Q&A edition of Faces in Kansas. This feature is presented by Gray Drug and Fountain. Gray Drug would like to congratulate Vincent Palen on another terrific basketball season! Gray Drug is a proud supporter of Trojan Athletics! How did you get involved in basketball? At a young age, the neighborhood kids and I would always play basketball together at one another's house. We all wanted to play basketball like our older siblings did. Also, my dad is a referee and I traveled with him multiple times as a young kid. What are your goals this season? Win league and win a state championship. Do you guys have a shot to make a run this year? Yes, I believe we have a good shot to make it very far this season. We have size inside and also shooters on the outside. Everyone on the team is also very athletic. What makes you such a force as a player? What makes me such a force as a player is that I am an all-around player. I can shoot it from anywhere but can also drive into the lane for a lay-up. I am able to push the ball down the court and find an open teammate. I am a leader on the team and my teammates believe in me in every situation. What’s the atmosphere like to play basketball for your school and town? The community comes out and supports every game. The community supports our schools in everything we do. Also the band plays loud as the other students yell from the student section. For anyone that hasn’t seen one of your games, why come to one? We love to get out and push the ball and play great defense. We are also able to slow it down and pound it in down low. This years’ team doesn’t have many weaknesses. What are your strengths and weaknesses as a player? My strengths are definitely on the offensive end; I can shoot, but also I can drive, finish or kick it out for an open three. My weakness is my defense. Who are other key players on your team? Everyone on the team has their own role. Hudson Smith works exceptionally hard in everything he does. He goes after every ball and is a pest to the other team. Carson Cox is a shooter and plays good defense. Colin Chandler goes against their best post every game and plays great defense on them. Tate Thompson is 6’8” and has a great inside game. Our bench this year is deep. We bring in Bryce Mason (6’6”) off the bench for Tate, and he does a tremendous job defending the rim while also contributing on the offensive boards. Also we bring in Hudson Gray and Hayden Budke. They both have improved a bunch this year and both can go up and get any rebound. We bring Braxten Eilert off the bench as a sharp-shooter. My favorite part of basketball is the memories that I am able to create with some of my closest friends. Do you play any other sports, tell us about that, what other positions do you play? I’m involved in football and track & field. I enjoy competing in each sport and no sport is really a favorite over the other. In football, I am a wide receiver and defensive back, while in track I am in the 110 M hurdles, 300 M hurdles, long jump, and high jump. What is it like to play for your coach? Coach Eilert loves to have fun and joke around, but he also expects us to work hard during practice. He makes us into better players, but also better men at the same time. I trust Coach Eilert in every decision he makes and he trusts me with the ball in my hands at all times of the game. What did you and the team do in the off-season to become better? Most of our team lifted all summer, but we also played in multiple traveling tournaments and also played in a summer league. What interest are you seeing at the next level and what are your plans? Right now I haven’t received any interest, but I plan on playing a sport in college. Favorite thing to do when you aren’t playing sports? My favorite thing to do when I’m not playing sports is to hang out with my friends. In 10 years I see myself as a college graduate with a stable job that supports my lifestyle. Favorite subject in school, what type of student are you, GPA? My role model is my older brother, Caleb. He has taught me many things on and off the court. At a young age, we battled back and forth on the goal in the driveway. Every time he beat me it made me want to play harder and it made me into the player I am today. I always enjoy having my brother come and support me at every sporting event! Best place to eat in your town or the surrounding area? One thing the average person wouldn’t know about you? I love working on the farm! The summer before starting Jr. High I found myself at Wesley Medical Center in Wichita, Kansas. I was having trouble with my kidneys. I am better now, but still have to watch my salt and drink a lot of water.